very dear friends to tea. 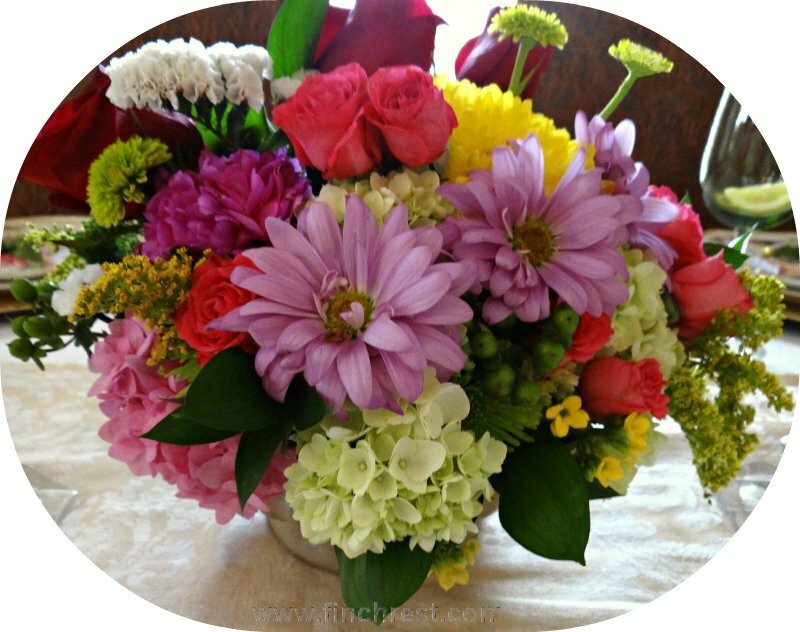 and transformed them into this colourful & fragrant centerpiece. This is my Noritake of Japan in the Lavegas pattern. I used a simple formal white tablecloth and cream damask table runner. from appearing too visually busy. knife holders and pretty gold flatware. (with soup and salad,) as well as providing traditional tea finger foods. with matching pens that went nicely with the table colour pallet. First tea pots were placed on either end of the table. My trusty drip catchers and feminine cosies did the trick! ground pepper were served first. Raspberry dressing was put into individual egg cups. 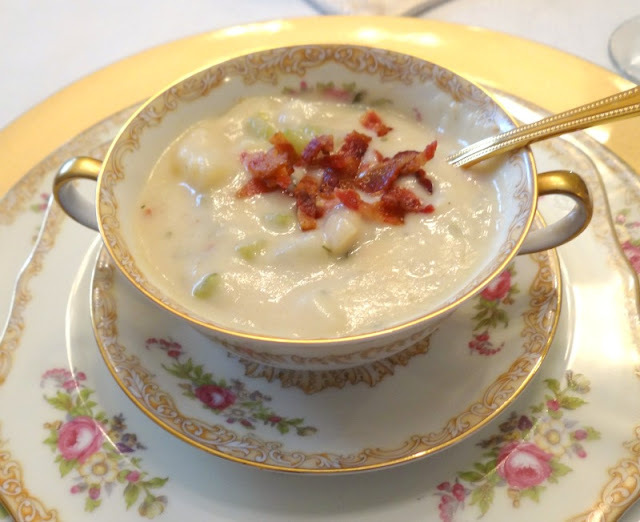 Next served: piping hot homemade Cream of Potato soup. The fresh bacon on top was a real hit! The finger foods were brought out on traditional two 3-tier servers. Savories on top. Scones in middle. Sweets on bottom. I ran out of room so put the mini quiche in with the scones. clotted cream, jam and lemon curd. Unfortunately I didn't take a picture of it. in etched pink Depression glass sorbet cups. the two large 3 tier servers were placed. It is always such a pleasure to host a nice afternoon tea. Thanks for visiting and allowing me to share tea with you! 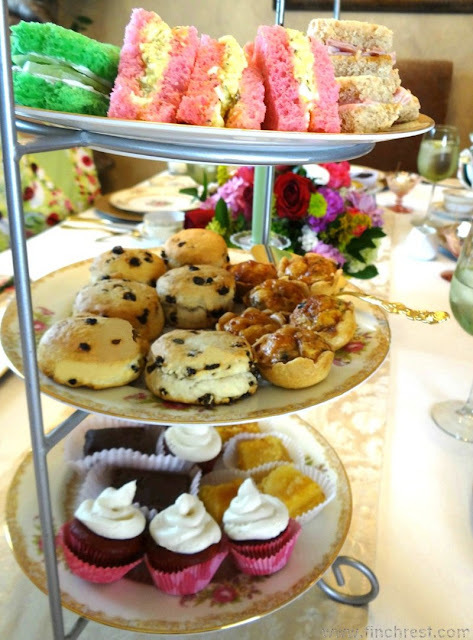 WOW, Michelle ... this afternoon tea for your friends was amazing. Pink and green -- fun! 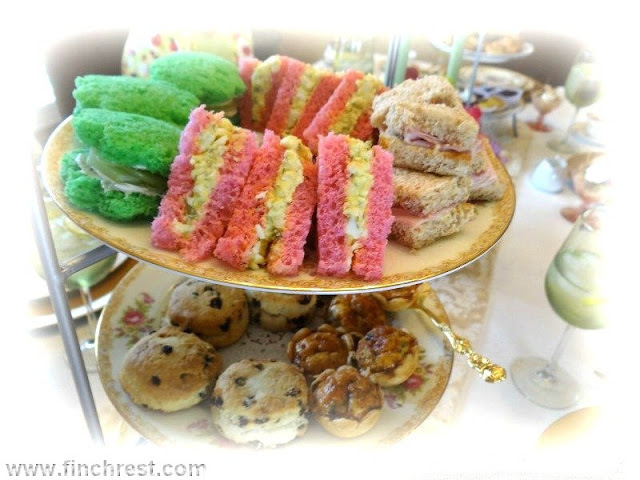 Your lovely Noritake china and pink depressions glass and the colored breads. Well done! How lovely, Michele! That soup looks delicious! I wish I could have "cream" soups, but most of them have flour in them. I've got to experiment using GF flours. What a great idea to put the dressing on the side in egg cups! I'll have to try that. Oh Michelle...what a wonderful tea party! Your table is lovely! I love the colored breads...how fun is that??!!! Your menu looks perfect and your ohotos are as gorgeous as always! Thanks for sharing your wonderful party with us! A beautiful afternoon tea! How I wish I lived near you! Your table looks so inviting and the food looks so delicious! I like to use colored bread, too. It adds so much to a tea party. Thank you for sharing! Michele, you presented and served a wonderful tea for your friends. I'm sure they felt special with all your effort. How pretty your table is, and how delicious the food looks! 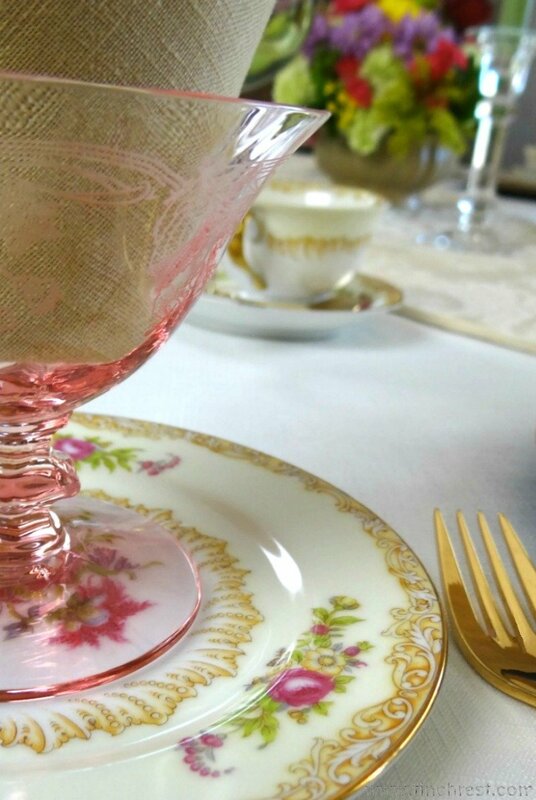 Love the pink Depression Glass with your china. 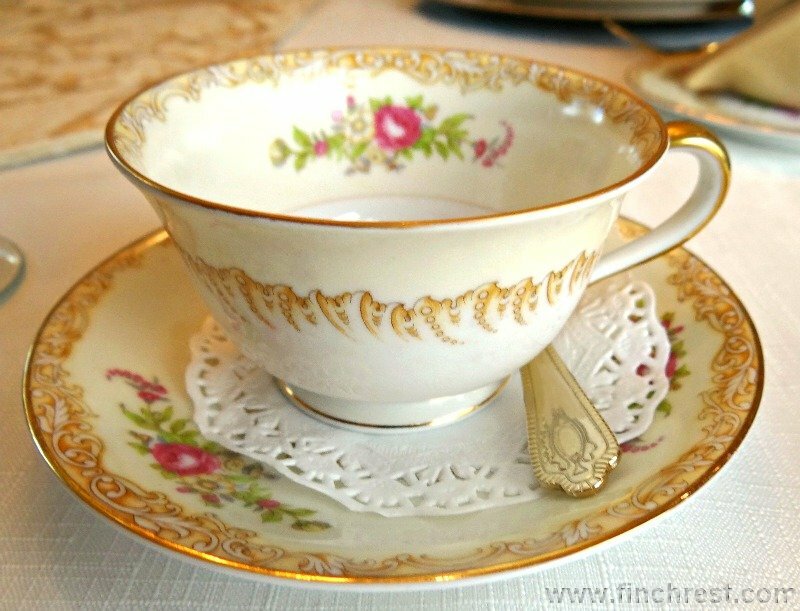 I just basically love pink DG anyway, as well as pretty china! Gorgeous. Vee, trust me, it just takes practice. 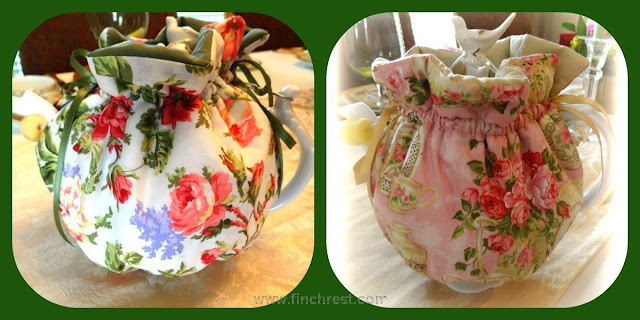 Having friends for tea can be as simple as a pot, some pretty cups and plates and napkins and a bakery purchased cake! The thing is to just do it- we ladies need one another and pretty and slow sweet time together.....it balanced out our crazy careers and family stresses evenly and makes us all better women. All over a hot pot and a slice of something sweet - doesn't have to be a big deal, it is a MUCH bigger deal to skip doing it altogether! All is very pretty and I know everyone had a great time. You do every thing up right. The food looks so mouth watering good. Love you china! Oh, Michele, what a lovely table! Everything looks beautiful and I just know everyone had a marvellous time. The potato soup looks wonderful and I have never seen pink and green bread before. That sure perks up a plate of sandwiches! Where on earth do you find bread like that? Thanks for sharing with us. Your china is beautiful! This is amazing...I bet your friends were blessed immensely!! I am so impressed. I found you through the blog hop and hope you can stop by to say hello. What is so great about your tea, is that you did it right the whole way...you did not hold back. I love a job done with excellence!! Oh wow, this is gorgeous & elegant! 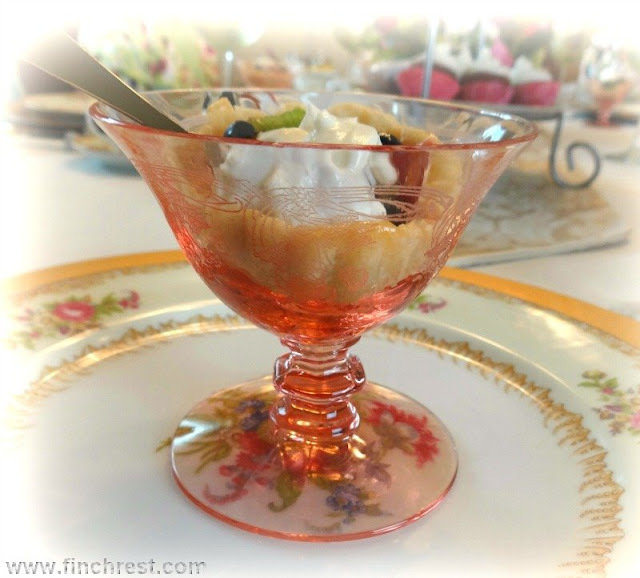 I don't know whether I'm more excited over the pretty china, pink sorbet cups or the delicious looking food! That soup!! That's all I can add is that your 5 friends are some lucky ladies indeed. You set such a pretty table, Michele! Your china and gold flatware really makes everything sparkle! Your menu is amazing! 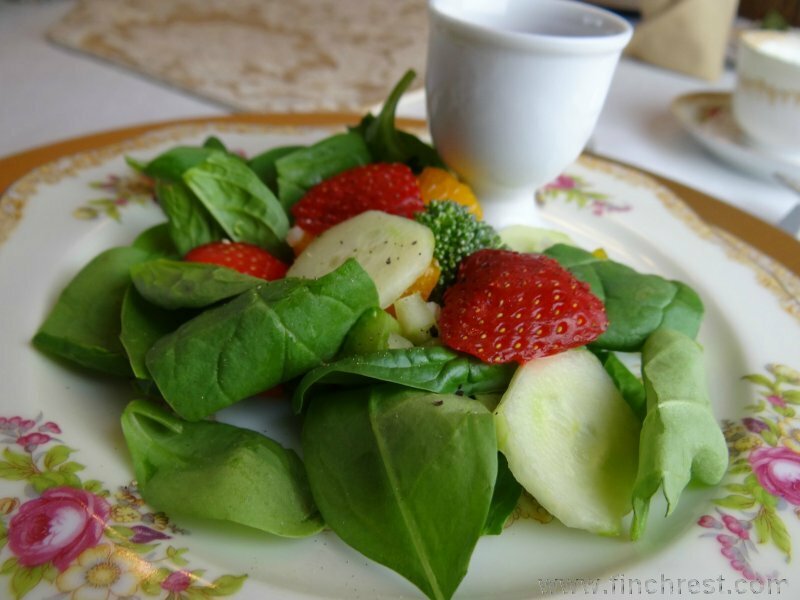 The soup and salad is perfect to go along with the finger sandwiches. Where on earth do you find colored bread?! I know you got lots of compliments and you should have, you put on a wonderful tea that your friends will remember for a long time! You have very fortunate friends! Such a lovely tablescape and an amazing menu. So wished I were there. You are an inspiration. I'm very impressed with your table and food selection for your tea party! It all looks so wonderful. I've actually been to a formal afternoon tea at a fine hotel downtown with a girlfriend many years ago. I loved the experience. I bet you had the most fun having your friends over for one at your own home. You got every detail just right! Everything is just perfect, and I love that the runner doesn't come off of the table. I have a little on in the house, and hanging anything is a potential for disaster. 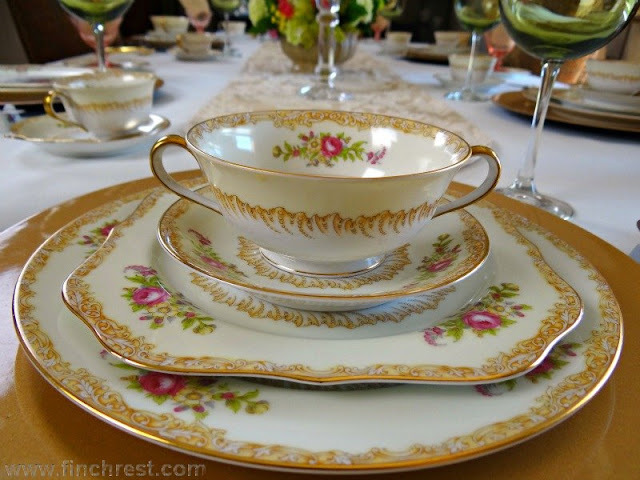 Beautiful china...Noritake from the 30's is so easy to pick out...it just has such a distinct look. Nice assortment of food, too! What a beautiful tea!!! Every little thing is just perfect. The dishes are exquisite and you arranged the flowers so beautifully. 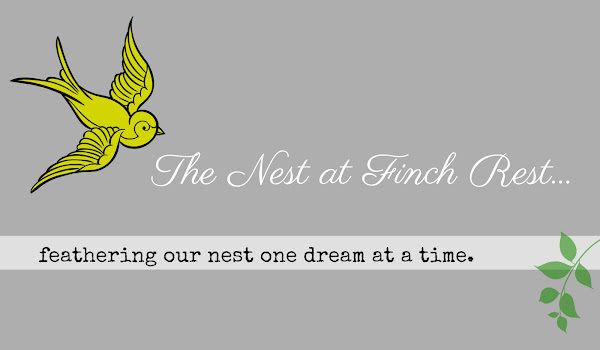 Your menu is divine and wow-it all came together with panache. I bet the ladies really enjoyed themselves. I know you did because I feel the same way when I get to do something like this. I love your response to Vee. You speak the truth. Please tell me how you dyed the bread? Thanks, Michele. What a lovely tea. And the food looked delicious and the table setting was absolutely beautiful! 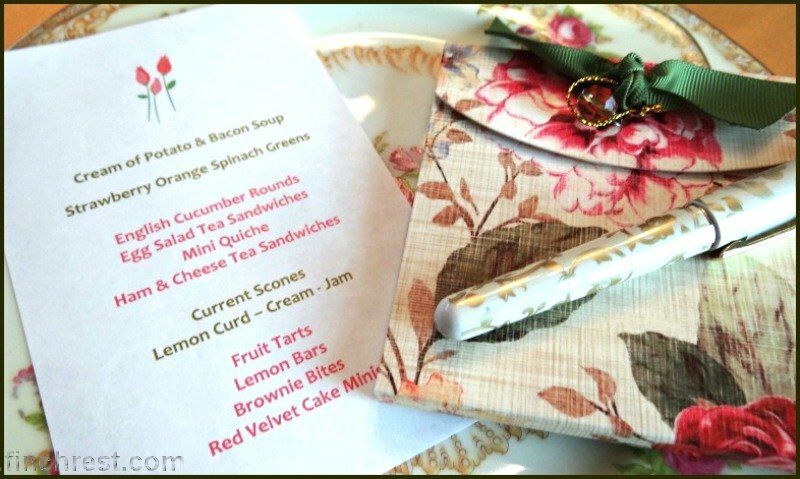 I'm sure your guests had a grand time at such a lovely event and I adore the menu -- I think menus are important! Simply stunning!! The table looks beautiful. I like the glasses and that china Wow! The food looks fantastic. Oh what lucky friends you have to be able to share this tea! WOW! So beautiful and the food looks just fabulous. I am drooling! I love the idea of using egg cups for dressing...so clever. May I steal that one? What a fabulous luncheon/tea setting! 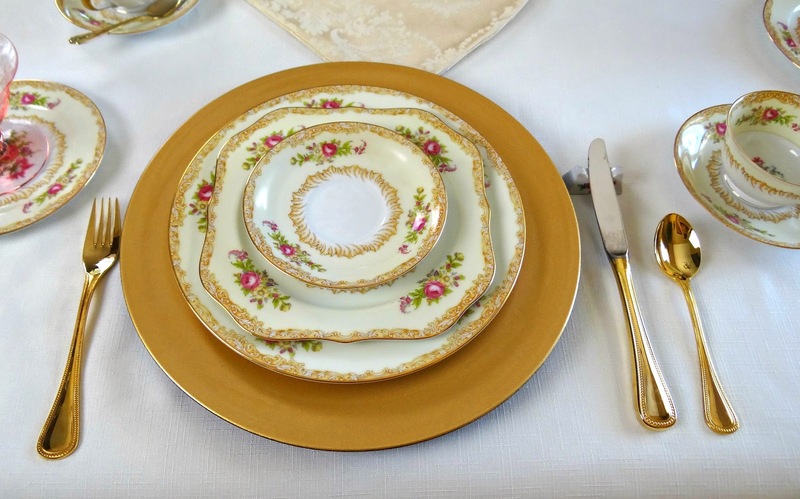 My heart beat a little faster when I saw the closeup of the placesetting of that beautiful china. I know your friends were delighted with your pretty table and delicious menu. THIS IS EXCEPTIONAL! You did a wonderful job and the tablescape is lovely! Please come link this to "Open House" as I think is a great! Breathtaking awesome tea! Your table scape is magnificent & so inviting. Love the colors, china & all the accessories. 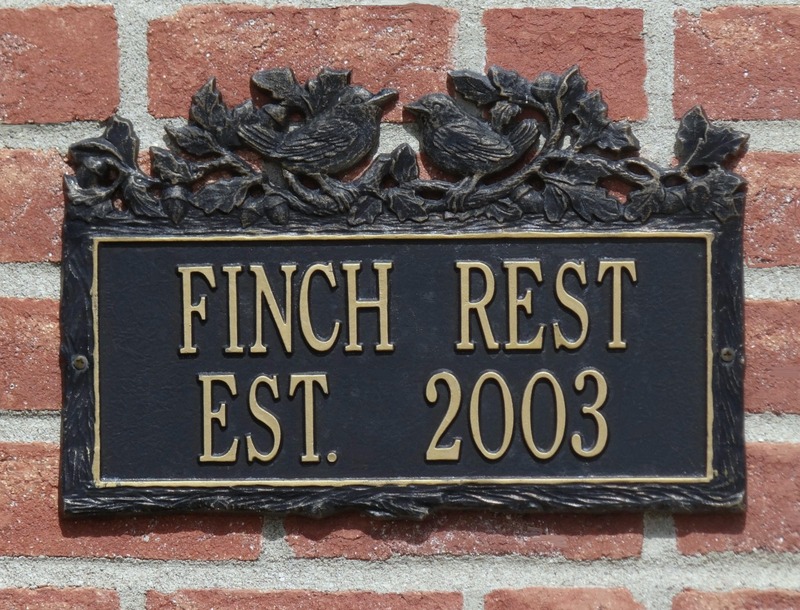 Your friends are very fortunate to have you as a delightful friend & hostess. Your guest must have felt like the Queen of England!!! What a over-the-top gorgeous high tea!!! I love your menu and your darling take home gifts. 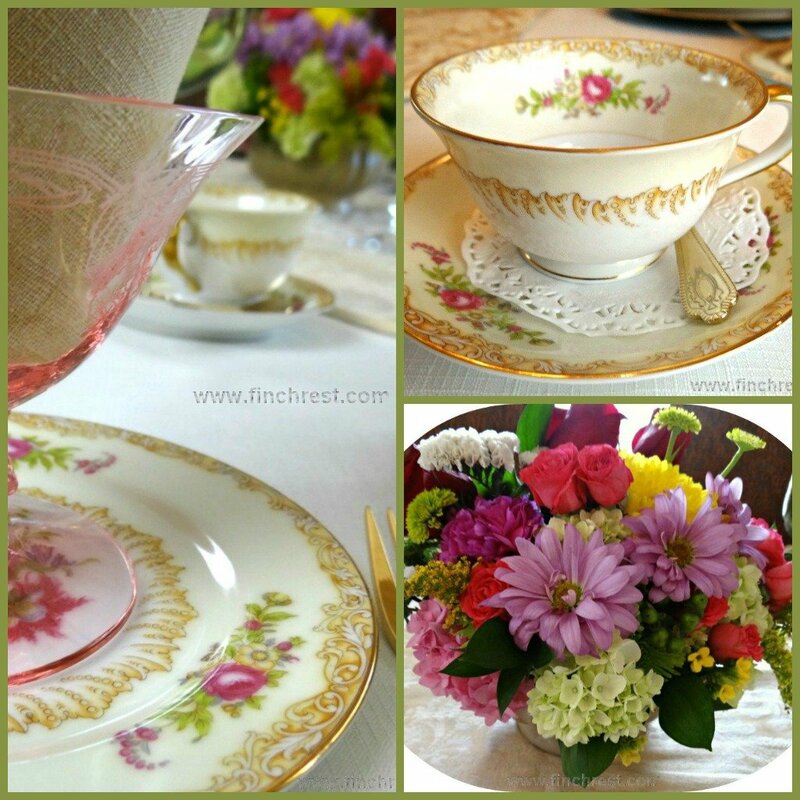 Michele this is one of the prettiest and detailed tea parties I have ever seen! Your menu looked delicious! Now I am most hungry for a spinach salad and homemade potato soup with bacon crumbles. Guess what we are having for dinner tomorrow night! I already commented but wanted to stop by and wish you a wonderful weekend. Thanks for your visit and Happy Pinks! Love your china! Lovely and lovelier! And Oooo that soup! It looks like something from a romantic guide to a charmed life. What a pretty china! Your entire tea party was an absolute beauty! So many special touches. I bet the colored bread was a hit. Just lovely! Michele, What a beautiful post. I'm so inspired by your afternoon tea luncheon. You really have a talent to display your gorgeous china and the menu is good enough for the Queen. Hats off to you!! 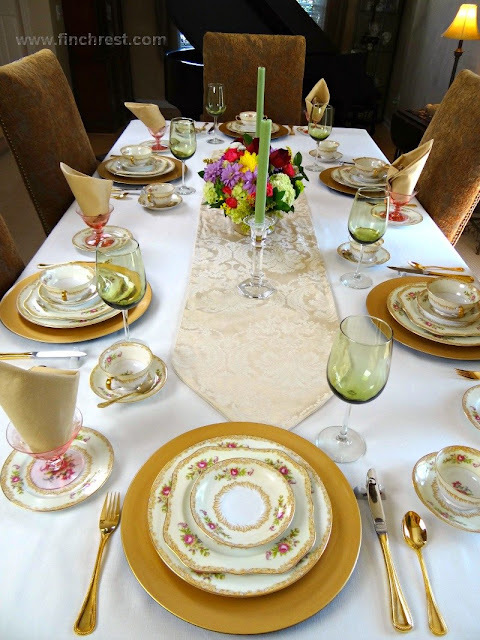 How sweet you are to host a luncheon for five friends. The table is perfect, I always like to see Noritate china and yours is beautiful. Your food all looks wonderful, you are a true hostess and offering each guest a gift. You're the best. You really know how to make your guests feel special! This table is so beautiful. Your china is gorgeous and all the food looks amazing! that soup sounds so good right about now! beautiful setting! Handpainted Nippon Teacup - wordlessly wow!